Born in Hastings, New Zealand, Harris is of Māori descent. Harris played his junior football for the Tamatea rugby union club and attended Hastings Boys' High School before being signed by the Melbourne Storm. In 2007, Harris played for the New Zealand U15's team. Harris played for the Storm's NYC team from 2010 to 2012, scoring 25 tries in 49 games. Harris played at second-row and scored a try in the Melbourne Storm's 2013 World Club Challenge 18-14 win over the Leeds Rhinos. In Round 1 of the 2013 NRL season, Harris made his NRL debut for the Storm against the St. George Illawarra Dragons at second-row in the 30-10 win at AAMI Park. 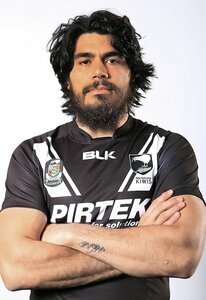 Harris was called up to the New Zealand Kiwis squad as 18th man for the 2013 Anzac Test, replacing Jeremy Smith. Harris was promoted to the playing squad on the day of the test match when captain Simon Mannering was ruled out with a calf injury and made his debut for New Zealand on the 19 April 2013 in the Kiwis 32-12 loss against Australia. On 9 October 2013, Harris was dropped from the New Zealand side for the 2013 World Cup, which had been announced a day earlier. The decision was made following the controversial change of mind of Sonny Bill Williams, who had previously ruled himself out of the competition, to join the squad. Harris turned down a position to tour with the squad and play in a pre-tournament match against the Cook Islands in order to have minor surgery and rest before the 2014 NRL pre-season began. Harris also refused to respond to Williams after the latter tried to reach out to him after the much publicized U-turn. In February 2014, Harris was included in the Storms inaugural 2014 Auckland Nines squad. In Round 4 against the Canterbury-Bankstown Bulldogs, after Cameron Smith suffered a back spasm in the warm up, Harris was appointed the goal kicker; Harris kicked 2 goals in the Storms 40-12 loss at NIB Stadium in Perth. 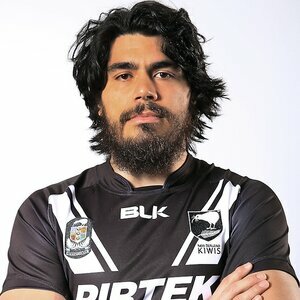 Harris was selected for the New Zealand Kiwis squad for the 2014 Anzac Test against Australia at SFS. Harris was selected to play off the interchange bench but was shifted to start at five-eighth over debutant Isaac John, Harris scored a try in the Kiwis 30-18 loss. On 7 May 2014, Harris re-signed with the Storm on a 3-year contract keeping him with the club till the end of the 2017 season. Harris finished the 2014 NRL season with him playing in all of the Storms 25 matches and kicking 2 goals. On 23 September 2014, Harris was selected in the New Zealand Kiwis 2014 Four Nations train-on squad. Harris was then selected in the final 24 man squad. On 3 May, Harris played for New Zealand against Australia in the 2015 Anzac Test, playing at second-row in the Kiwis' 26-12 win at Suncorp Stadium. In July 2015, the Storm played the first ever NRL game at McLean Park in Napier, New Zealand, playing against the St George Illawarra Dragons. Harris designed the team's jersey for the occasion. The Storm won the match 22-4. Harris finished off the 2015 season having played in all of the Storms' 26 matches, scoring 5 tries and kicking 3 goals. On 8 October, he was selected in the 23-man New Zealand squad to tour England. He played in all 3 matches against England in the Kiwis' 2-1 Baskerville Shield series loss. He scored 1 try, in the first test, in the Kiwis' 26-12 loss at KC Stadium. On 1 February, Harris was named in the Storm's 2016 NRL Auckland Nines squad. On 6 May, he played for New Zealand against Australia in the 2016 Anzac Test, playing at centre, after originally being named at five-eighth. On 1 February, the New Zealand Warriors announced they had signed Harris on a four year deal commencing in 2018.